Last week my Mac caught the 1938 movie Test Pilot on Turner Classic Movies (TCM). This Oscar-winning MGM flick starred Clark Gable, Myrna Loy (sigh), Spencer Tracy, and Lionel Barrymore. I’ll skip the plot synopsis; TCM seems to cover that well enough. Overall, the story would be pretty good even without all the aviation footage. In fact, it might make my short list of favorite aviation movies, if I had one. Seversky SEV-S2 Racer (www.AirRace.com) Click image to view source page. Fairchild 24 three-seat cabin monoplane. Partly visible parked at the mock “Wichita” airport, actually an airport in California. 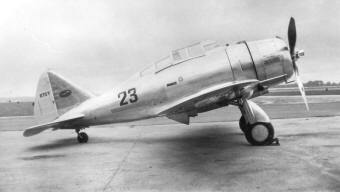 Ryan STA two-seat sport monoplane. Flown with stunts and closeups at the “Wichita” airport. Douglas DC-3 commercial transport. Unloading at the “Wichita” airport; some also partly visible in “mock New York” hangars. Consolidated PBY Catalina amphibian. Seen through a window in “New York”; fuzzy but big. Northrop A-17 Nomad two-seat ground attack bomber. Flown and parked in multiple scenes. Boeing 247 commercial transport. Parked in the background outside the “New York” terminal. Grumman F2F biplane fighter. Taxiing past outside a window at the National Air Races; fuzzy, but several go by. Boeing YB-17 Flying Fortress bomber. Early variant with fixed “blister” gun ports. Flown in multiple scenes. The “Drake Bullet” plays the lead aviation role, first flown by Gable in a cross-country record attempt. The “Bullet” is seen again later in a pylon race; flown by a rival pilot while Gable now flies the “Number 7.” Of course these two planes are the leaders as the race ends. Live racing footage was reportedly filmed at the 1937 National Air Races, where a great many other airplane types are visible as background or in bit parts; too many to list in this already-bloated post. The pylon race sequence seems to more-or-less portray actual 1937 Thompson Trophy race entrants, although I suspect film of other events was also used. Full scale shots are intercut with fictionally numbered model effects so the pylon race appears to unfold according to script. Live action elements of the fire and crash scenes were probably staged. The pylon race sequence appears to be the most complex, but a similar full-scale/model intercut approach is used for other flying sequences througout the show. The effect is probably best if you can back away from the technical details and pay more attention to the story. According to the Massey Air Museum website, Test Pilot also featured a Harlow PJC-2 and several Douglas B-18 Bolos. Perhaps a Harlow was filmed during production, but I can’t find it in the version I watched; and the fleeting, overhead B-18s in the final montage might as well be DC-2’s. The Massey site also says a DC-2 hulk was used to simulate the crashed YB-17. I don’t believe that. The crashed plane has distinct Boeing cockpit and tail outlines; to reshape them from a Douglas DC-2 hulk would be as hard as scratch building a mock-up. It is easier to believe that a civilian Boeing 247 hulk was used. (Two mock engine nacelles would have to be added in either case.) The DC-2 was a more famous plane that might easily supplant the 247 in reportage, either initially or after one or two retellings. As I write this, Wikipedia states only one P-35 was modified to the SEV-S2 racer variant and flown in the 1937, 1938, and 1939 Nationals, placing first, second, then first again in those years’ Bendix cross-country events. This plane is the one featured in Test Pilot. Records, however, indicate two Seversky racers raced in the 1937 and 1938 Nats. The damaged AP-2 was rebuilt with changes to create the AP-7 (also not yet in Wikipedia). Famed “aviatrix” Jackie Cochran flew this plane to beat the SEV-S2 in 1938, the one time the S2 placed second in the Bendix event. Cochran also entered the AP-7 in the 1939 race, but declined to start because of heavy fog. I almost mistook the A-17 Nomads for T-6 Texans, but the A-17’s canopy is longer than the T-6’s, and has a solid middle section. Also the antenna mast is placed differently. I was puzzled at first by the Nomad’s antenna mast (on examples that had one). The T-6 has a forward-placed mast, with a wire antenna running back to the tail. The A-17 mast is much farther back; too far, I thought, for a fore-aft wire antenna in the same band. I was stumped until I found a drawing (at airwar.ru) that showed the A-17’s antenna was a more-or-less crosswise inverted-V, with its ends anchored out on the wings. This configuration might offer a better radio footprint, but I suspect it was draggy. I notice the Swedes restored the fore-aft antenna on their A-17 variant (8A-1). In this movie the Fairchild’s engine is hidden and its distinctive landing gear struts are only visible by their shadows, so I almost mistook this plane for a Stinson Reliant. But the Stinson’s back window and fin outlines are less, shall we say, graceful, while the Fairchild looks like a perfect match. The Ryan STA turns up fairly often in old movies. One example is Too Hot to Handle; also a 1938 Gable/Loy film, this time with Loy as the pilot. I wonder if they shot their STA closeups in sequential sessions, once with Gable in back, then with Loy? Another STA (or perhaps the same one) appears in 1941’s Dive Bomber; this time in disguise—more about that in a forthcoming post!